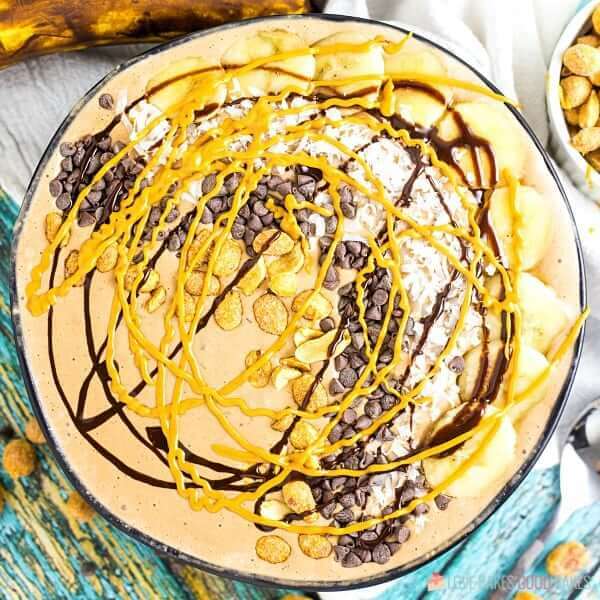 Change up your boring breakfast routine with this Chocolate Peanut Butter Smoothie Bowl! Add your favorite toppings for a delicious morning treat! I don’t know about you, but I sometimes get stuck in meal ruts. Especially breakfast. 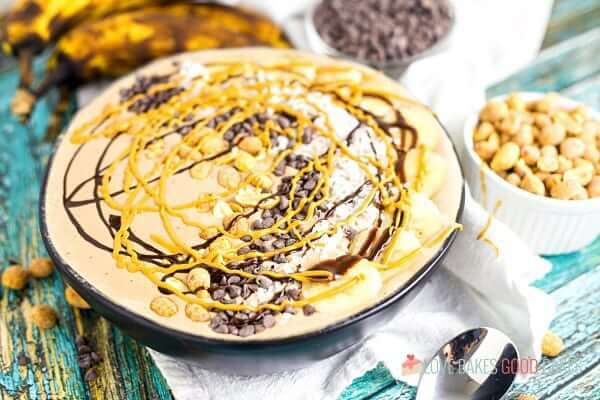 This Chocolate Peanut Butter Smoothie Bowl is a great way to change things up, for a healthy and delicious way to start your day! One of the things always on my weekly grocery list is bananas. They make a great snack and we love adding them to cereal, oatmeal, and bread. As many bananas that my kids will eat, inevitably I always seem to have 2 or 3 that are extra ripe. 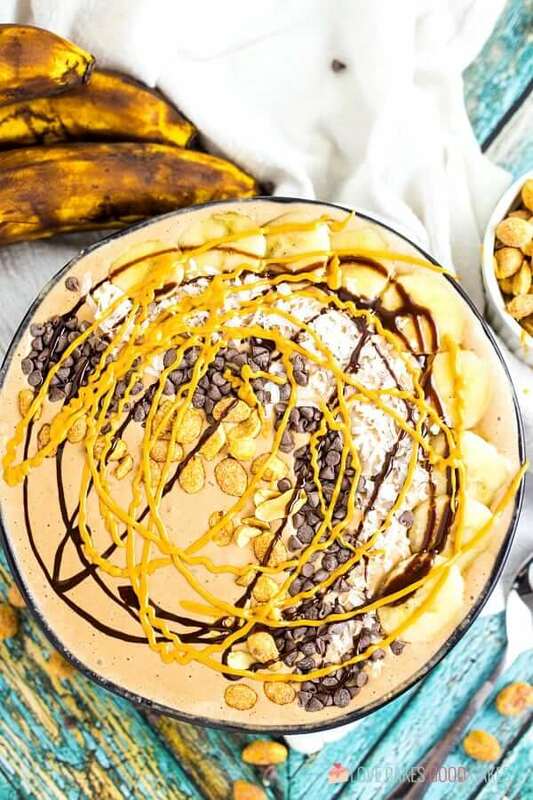 I’m almost convinced my kids leave them to overripen on purpose so they can have banana bread or this Chocolate Peanut Butter Smoothie Bowl! 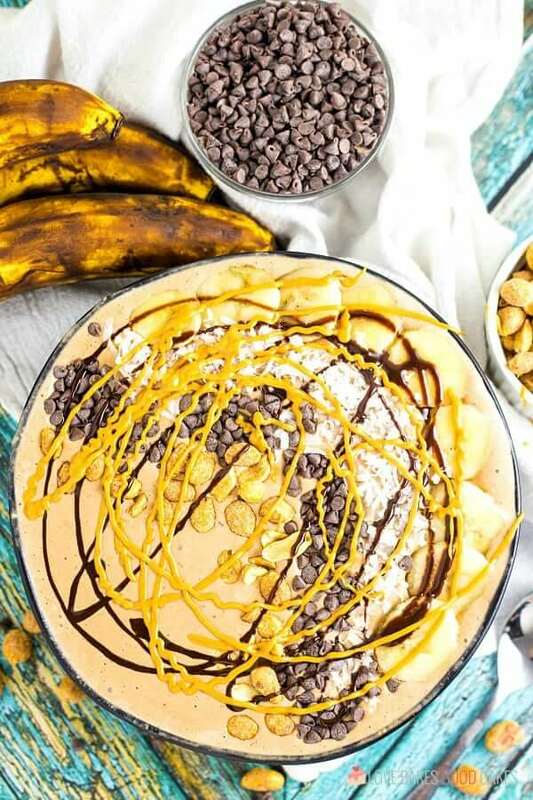 Since I almost always seem to have a few bananas on the counter that have seen better days, I needed recipes to use them. 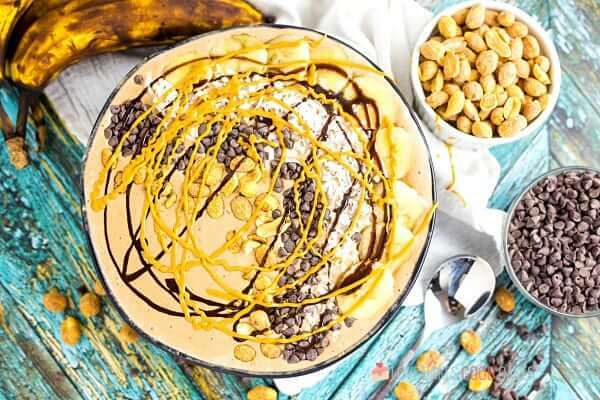 This smoothie bowl recipe tastes best with overripe bananas – like the kind you would use to make banana bread! They give the most flavor! You guys, this recipe is so easy. However, you will need a blender or food processor. This is a great recipe for those busy mornings. 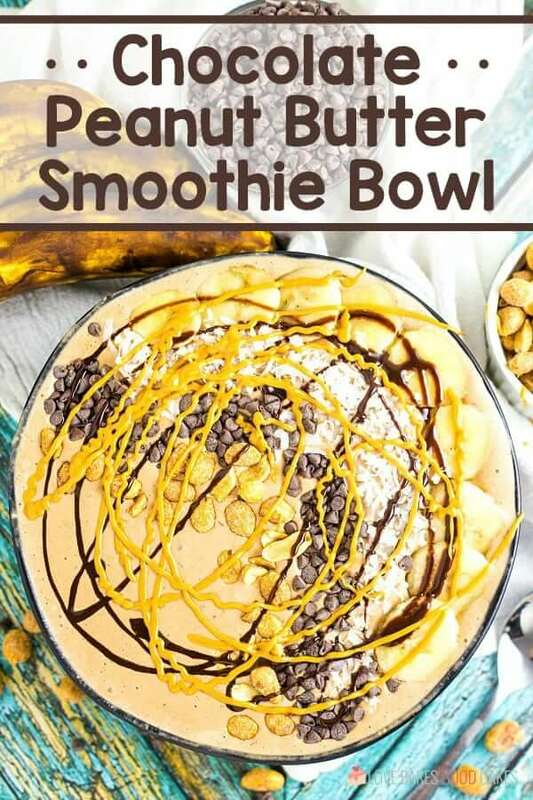 Just place all of the smoothie bowl ingredients in a blender, blend, and pour it into a bowl. Then top it off with your favorite toppings. Finally, devour the yumminess! Besides bananas, you’ll need a few common ingredients. I would suggest freezing the yogurt for a thicker smoothie. In the recipe, I’ve included some suggested toppings, but feel free to add things you like for a custom recipe. I’ve even added a few additional topping ideas in the recipe notes. 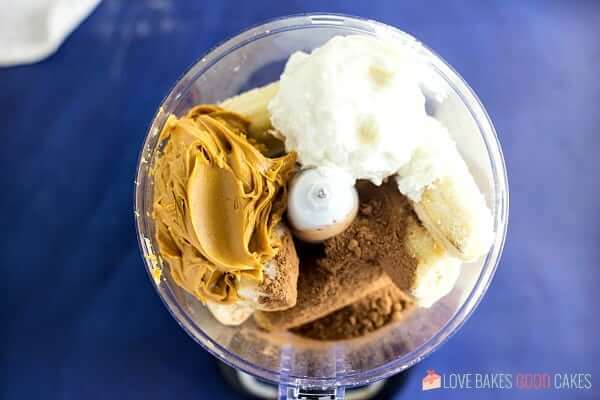 Combine bananas, milk, yogurt, peanut butter, cocoa powder, and vanilla in a large blender or food processor. Blend/process until smooth. Pour into a bowl, and top with toppings. 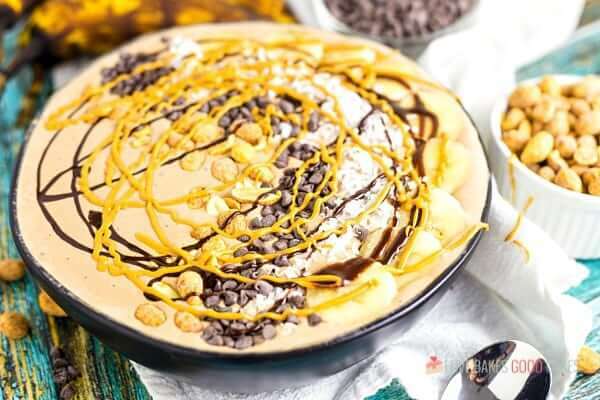 To make the chocolate drizzle, either use chocolate sauce (like for ice cream or chocolate milk) or scoop about 1-2 tablespoons chocolate chips into a microwave-safe baggy. Zip closed. Microwave for 20-30 seconds until chocolate is melted. Repeat for an additional 20-30 seconds if chocolate is not melted yet. Snip a small corner off the baggy and drizzle chocolate over smoothie bowl. To make the peanut butter drizzle, scoop about 1 tablespoon peanut butter into a microwave-safe plastic bag. Zip closed. 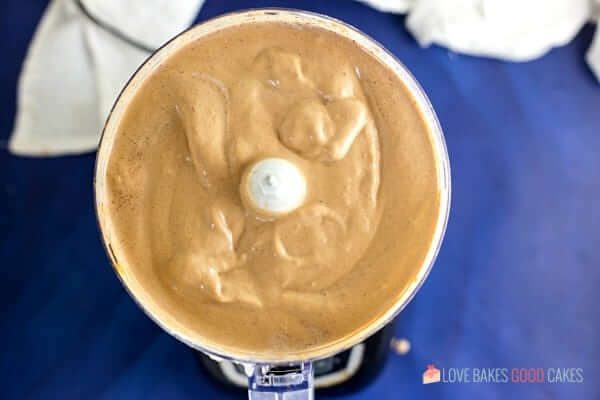 Microwave for 15-25 seconds until peanut butter is softened. Snip a small corner off the baggy and drizzle peanut butter over smoothie bowl. Other toppings ideas for your smoothie bowl include almonds, pecans, coconut, dried fruit, or other fresh fruits like strawberries, cherries, or blackberries. This is looking very delicious, cannot wait to try this one at home.Thank You!